Got the latest iPhone™5, iPad™ mini or the latest iPod™ touch and need a replacement or additional sync and charge cable, but don't want to pay sky high pricing? The new C-USB-LIGHTNING is totally compatible with the new, 8-pin Lightning interface adopted by the new Apple™ mobile devices. This new, higher speed connector uses 'adaptive transfer' technology to make faster uploads and downloads to your device from applications such as iTunes™, all with the added benefit of charging your Apple™ device. 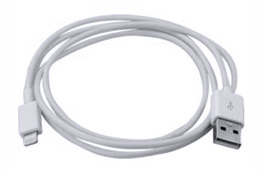 Offering a generous 1-metre cable length with robust Lightning and standard high-speed USB cable connector, the new C-USB-LIGHTNING is your ideal choice for your compatible Apple™ Lightning devices but without the sky high price tag.